Within a short period of time after the war, living conditions in West Germany and East Germany became distinctly different. With the help and support of its occupying powers, West Germany set up a capitalist society and experienced such a rapid growth of their economy that it became known as the “economic miracle.” With hard work, individuals living in West Germany were able to live well, buy gadgets and appliances, and to travel as they wished. Nearly the opposite was true in East Germany. Since the Soviet Union had viewed their zone as a spoil of war, the Soviets pilfered factory equipment and other valuable assets from their zone and shipped them back to the Soviet Union. When East Germany became its own country, it was under the direct influence of the Soviet Union and thus a Communist society was established. In East Germany, the economy dragged and individual freedoms were severely restricted. By the late 1950s, many people living in East Germany wanted out. No longer able to stand the repressive living conditions of East Germany, they would pack up their bags and head to West Berlin. Although some of them would be stopped on their way, hundreds of thousands of others made it across the border. Once across, these refugees were housed in warehouses and then flown to West Germany. Many of those who escaped were young, trained professionals. By the early 1960s, East Germany was rapidly losing both its labor force and its population. Having already lost 2.5 million people by 1961, East Germany desperately needed to stop this mass exodus. The obvious leak was the easy access East Germans had to West Berlin. With the support of the Soviet Union, there had been several attempts to simply take over West Berlin in order to eliminate this exit point. Although the Soviet Union even threatened the United States with the use of nuclear weapons over this issue, the United States and other Western countries were committed to defending West Berlin. Desperate to keep its citizens, East Germany decided to build a wall to prevent them from crossing the border. Therefore in the night of 12-13 August, trucks with soldiers and construction workers roared through East Berlin and while most of Berliners were sleeping, they teared up the streets, cut off the telephone wires that were connecting the East and the West together and lift up the Wall. The next day, the separation was made in a brutal way and the people saw the wall stretched over a hundred miles. It ran not only through the center of Berlin, but also wrapped around West Berlin, entirely cutting West Berlin off from the rest of East Germany. 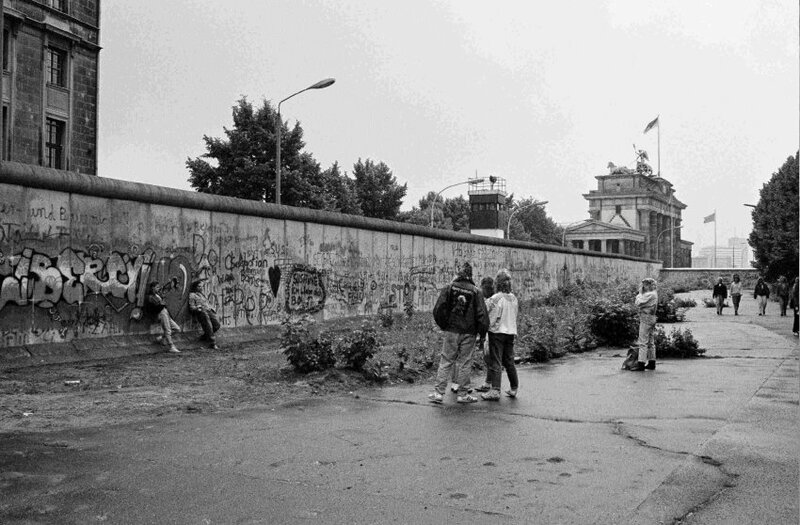 The wall itself went through four major transformations during its 28-year history. The Berlin Wall started out as a barbed-wire fence with concrete posts, but just a few days after the first fence was placed, it was quickly replaced with a sturdier, more permanent structure made out of concrete blocks, topped with barbed wire. The first two versions of the wall (barbed wire and concrete blocks) were replaced by the third version of the Berlin Wall in 1965. This version consisted of a concrete wall, supported by steel girders. The fourth version of the Berlin Wall, constructed from 1975 to 1980, was the most complicated and thorough. It consisted of concrete slabs reaching nearly 12-feet high (3.6 m) and 4-feet wide (1.2 m), plus it had a smooth pipe running across the top to hinder people from scaling the Wall. 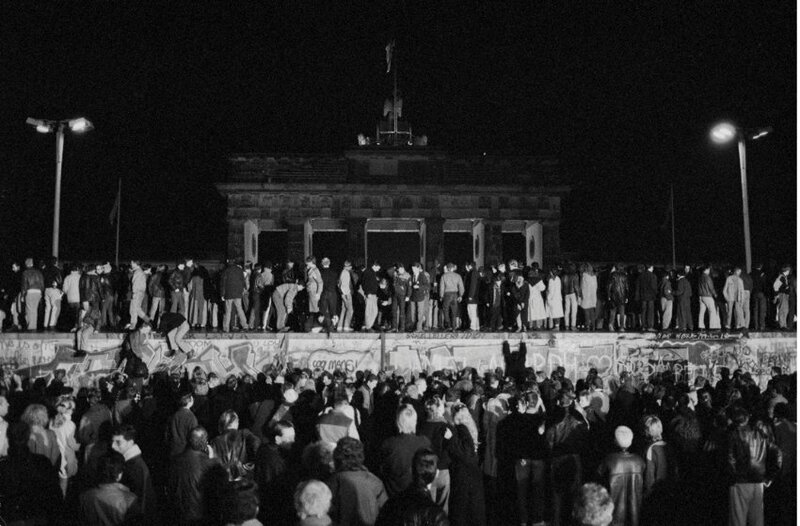 Could the Western Powers have stopped the East German building the Berlin Wall? One theory is that John J. McCloy was warned by Khrushchev during his stay on the Black Sea, but he denied it. Another general argument is that with all the allied inteligence spies, agencies and informers it was impossible not to know about this plan. Although the East Germans had run this operation in an impressive way because everything was co-ordinated by a small group of people. When President Kennedy finally came under criticism for inaction and in January 1962 ordered a review of military planning in Berlin and Germnay over the period, there was no evidence of any draft order to remove the wire or wall. Western leaders saw the issues of August 1961 in purely black and white terms. Kennedy was recorded as saying “It`s not a very nice solution, but a wall is a hell of a lot better than a war”.